I do. I really do. Do you? Your soft pink lips. I miss them. With you I want to live. In between your heart and soul, I rest with you. I wake up with a longing to feel you in my arms. Every day. 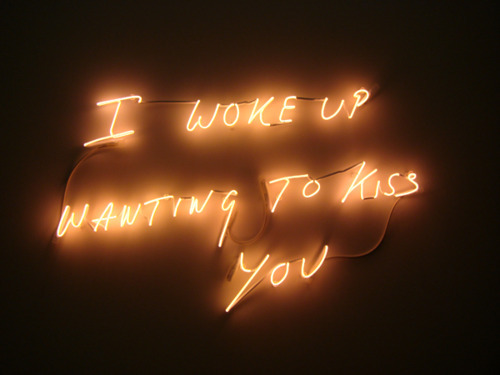 *The above is an artwork by British artist Tracey Emin in 2010. It was featured at an exhibition by neonist Kerry Ryan and artist Declan McMullan, curators and producers of 80 + Artists 100 + hours. Emin has been one of my favourite Brit artists ( Sarah Lucas, Damien Hirst, Gilbert & George are my other favourites if you’re keen to know) ever since I saw her work Everyone I Have Ever Slept With 1963–1995, a tent appliquéd with names, and My Bed — an installation of her own unmade dirty bed. I met Emin once at a book signing for Strangeland (2005), her long-awaited memoir, and she was a bit snarky and intimidating to talk to. It was as though she was in a rush and had somewhere else better to be. I felt cowed and still do whenever I think of the moment I asked her to sign my copy. I still have the book neatly stacked in between my Terry Pratchett novels. But I have always thought she was an extremely intelligent, thoughtful person when I started reading her columns in Independent in 2005. So I guess I am pleased to have met Emin at least once in my life. She inspires me to appreciate art installations more.